We deliver the most trusted boat detailing Charleston has to offer. We provide one time services as well as ongoing monthly maintenance programs. Protecting exterior surfaces is necessary to keep your boat looking its’ best. Each surface requires cleaning, polishing, and UV protection. Our team is well trained to use the correct products for each surface being treated. We only use quality marine products. Each product we use is chosen specifically for your boat depending on the condition. We take pride in our knowledge of marine products and proper use of them. Proper detailing should be only done by professionals. Anyone with a bucket and a brush can clean a boat. However, without years of experience and knowledge of how marine products work, serious damage can be done to your vessel. Interlux wrote an exceptional article explaining the delicate process of detailing. You can read that here. We’re here for all of your boat detailing needs. 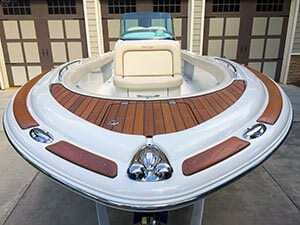 Most boat owners schedule their boat for a complete detail twice a year. Once at the beginning of the season and again at the end. Many want the service done before they sell their boat. Some even call us immediately after they have purchased a new boat and want it pristine from the beginning. Whatever schedule fits your needs, we are here for you.